Adventure games have been rising in popularity over the past couple of years and that is largely thanks to games that are willing to bend the genre's typical rule set. Wadjet Eye Games' Primordia takes a very different approach to adventure games as the company has become known for keeping it classic on all fronts. The look, the feel, the puzzles, and the gameplay all evoke a sense of nostalgia asPrimordia's world and gameplay is more akin to The Secret of Monkey Island than The Walking Dead. In a bleak world filled with acid rain and sludge our heroes, Horatio and Crispin, set out to find what was taken from them. What follows is an old-school point and click adventure that is filled with some great characters, some strange moments, and a bit of uneven storytelling. 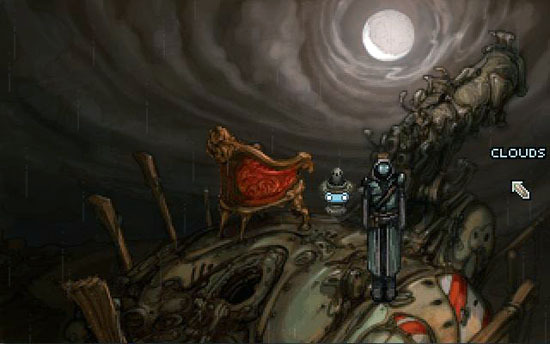 Primordia is a point and click adventure game with little in the way of other controls. At times you'll be required to type in a number or two but for the most part your mouse is the key to any and all puzzles. From the start Horatio and Crispin, a couple of scrappy robots just looking to find their way, are faced with a rather large problem. A large laser firing robot has stolen their power source and without it the two bots may run out of power. This opens up the world to exploration as things become clickable, making them tools for future puzzles. After playing multiple Wadjet Eye Games, and the older games that Wadjet builds from, the formula for playing becomes obvious. Hovering your mouse over the entire screen, inch by inch, reveals things to pick up and talk about which leads to puzzles being solved or information being retrieved. Don't expect any handholding as Crispin, your floating sidekick, will only give out a hint or two when you're in complete desperation. For the most part it's up to the player to find what they need to solve each puzzle, as it should be. Once you pick up an item you can sometimes connect it to another item in your inventory to create an item needed for solving a puzzle. The issue here is that, for whatever reason, linking X with Y works but linking Y with X doesn't. I found this to be a tad frustrating when I'd be stuck on a puzzle for a bit only to find out all I had to do was switch the order of items I was trying to connect. On the other hand, some puzzles were so blatantly obvious that having to struggle with some felt preferable at times. Perhaps the oddest thing about Primordia is its final few puzzles. There are no spoilers here but I found that after a certain point the puzzles became very 1,2,3 and everything that was happening happened in minutes when I thought it should've taken Horatio hours to complete. In other words, he finds The Master Sword, rescues Zelda, and defeats Ganondorf within a half hour. That isn't to say the puzzles aren't well thought out and interesting, they are, they just seem to flash by. Primordia is a disgustingly beautiful game. The sludge that fills the air mingles with the metropolitan metal that shines in the background and it all gives off a very Beneath the Steel Sky vibe. The sprites, yes I said sprites, in Primordia are vividly detailed and Horatio himself looks like a walking piece of dystopian art. Certain scenes are simply breathtaking but I'll leave those to you to find. A big component of adventure games is being able to find the things you need to click when you need to click them. This means tastefully making an object obvious without having it look like it doesn't fit in the world. Primordia does this very well and makes the objects you need look very obvious without being overstated. The throwback visuals that Wadjet Eye Games was going for come through in a largely positive manor. Occasionally certain objects or characters seem hidden by the large amount of pixels in the frame but other than that the game looks and plays like a classic adventure game. Utilizing a 90s style of pixilated graphics can be a difficult balance between new and old but Primordia manages to balance the old style with their beautiful new age art. 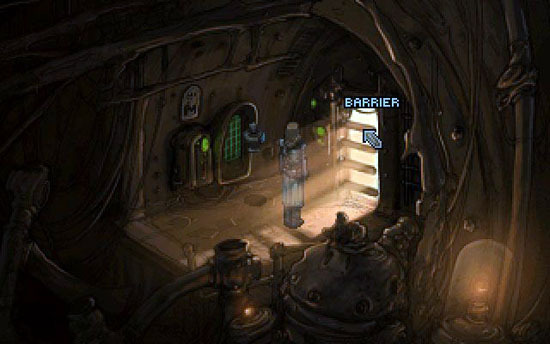 The majority of fun from Primordia, and any adventure game, comes from the story and the puzzles within the game. Primordia definitely has some fun puzzles that, while they don't reinvent the wheel, will keep you guessing for a bit. However, where Primordia shines is in its story and its voice work. Logan Cunningham, of Bastion fame, voices the main character of Horatio and does a great job of bringing the character's harsh life and history to the player. Other characters in the game range from a biblical lunatic to a one-word killer but the single common thread through all the characters is the excellent voice work. Some characters sound more metallic than others with tinges of squeaks and beeps thrown into their dialogue while others sound like a human talking into a tube. The range, and execution, of these voices makes the story and dialogue progress in an easy to digest manor. Since there will be times where you're sitting there for a few minutes listening to a story it's nice to have that story told by an enjoyable voice. 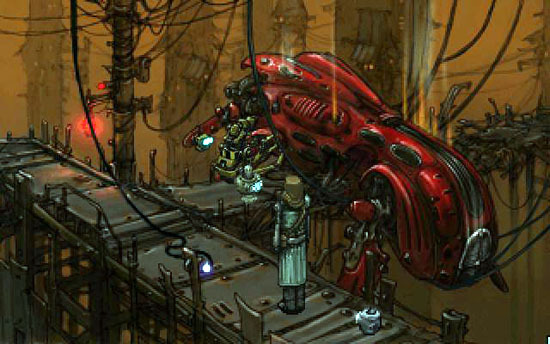 The story in Primordia is one of a dystopian future ruled by the metal class. Robots have become the dominant species as the majority of other life forms seem to have either died or disappeared. Through a book Horatio owns called The Gospel of Man you can read whispers of who this biblical character, "Man", was and what was so great about him. A few robots follow this "Man" as a biblical god while others just want to progress forward into a new time of peace and prosperity, a new Primordium. 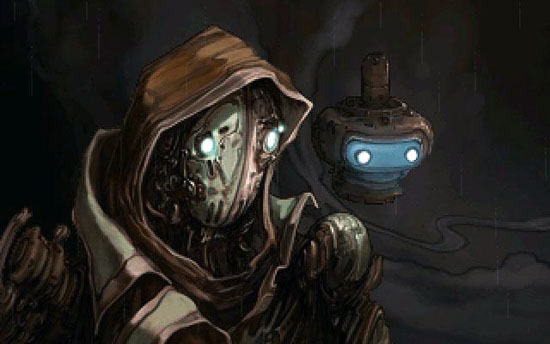 The story in Primordia unfolds pretty elegantly as Horatio learns bits and pieces about what's going on in the world and what his past life truly was. Unfortunately, the last third of the story feels rushed and hurried as new facts are thrown at the player and some might be missed altogether. The best advice here is to read everything slowly and make sure you find every bit of info possible towards the end. Finding certain aspects of Horatio's character shouldn't be voluntary, especially when they're so vital and interesting. Primordia definitely has some caveats when it comes to storytelling and pace but the story is interesting enough to warrant a play through. The world you inhabit as Horatio is dark and beautiful and the voice work is topnotch. Characters have a lot to say and it's all worth hearing, and the puzzles will keep you intrigued as the story moves forward. There's a dark and meaningful story within Primordia and despite the rush at the end, it's a story worth hearing. I truly want to see what happens next in the story but the puzzles, voices and energy meter are doing a lot to make me not want to re-enter the world.